Dogs are some pretty smart creatures. Cops use them to for search-and-rescue missions or drug hunts, the blind use them for street guidance, and Digital Trends’ Andrew Couts trains his pup for pure, heart-warming YouTube fun. They’ve also been known, on several occasions, to be extremely heroic and loyal, saving numerous owners from fires, storms, and assaults. 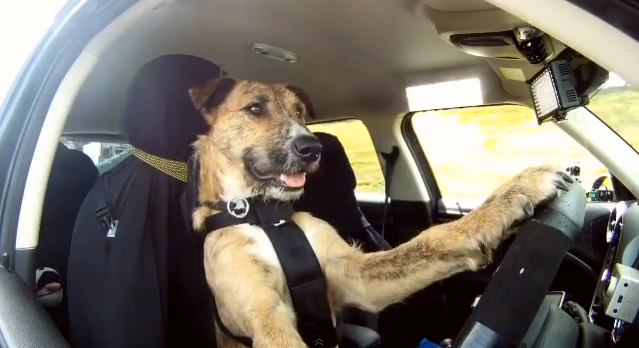 Since these canines are so good at learning various tricks, New Zealand’s Society for the Prevention of Cruelty to Animals (SPCA) decided to teach them how to drive. You’ve read that right: Drive. An activity most humans can’t even perform properly. In a recently released video, the SPCA showcases three dogs – Porter, Ginny, and Monty – being taught to drive a Mini Cooper, and focuses on Porter making a right hand turn on a giant racing course. The car has been outfitted with custom, extended push pedals so most dogs can reach and control the mechanics. Although the sample video shows Porter making a simple and slow turn, the idea that dogs can eventually learn to drive cars just as well as Google’s self-driving cars is just mind-blowing, to say the least. Will dogs become the new designated drivers? If so, this just gave a whole new meaning to these pups as man’s best friend. Watch the video below to see Porter hitting the race track and schooling most 16-year-old Americans. Correction: The earlier version of this article stated that Porter was driving a manual transmission car. After further review, the Mini is an automatic, and we have corrected this error.